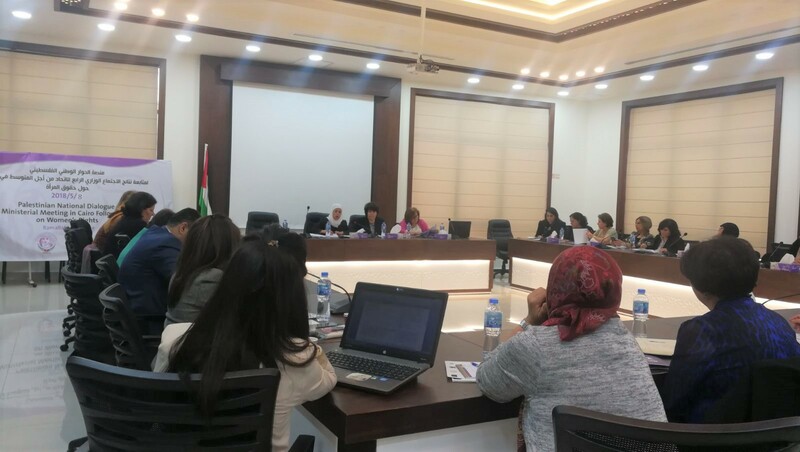 With the support of the European Union, Euromed Feminist Initiative represented by its members in Palestine; the Palestinian Federation of Women's Action Committees and the Palestinian Working Woman Society for Development, organized a national dialogue "Following up on the 4th UfM Ministerial Meeting on women’s rights" on the 8th and 9th of May 2018 in Ramallah. Click here to read the press release. The dialogue was attended by representatives of the Ministry of Women Affairs, the Ministry of Justice, the Ministry of Social Development as well as women rights and human rights organizations, academics, experts, legislators, representatives of parliamentary blocs, political parties, members of the Legislative Council, international development agencies and diplomatic bodies. They discussed the Ministerial Declaration from the 4th UfM ministerial meeting on women’s rights (27/11/2017, Cairo) and the Declaration of Civil Society Conference (23-24/11/2017, Cairo) with policy recommendations to be implemented before the 5th UfM Ministerial Meeting.